Do you want to learn more about Cheap Runescape Gold ? RuneScape, as always, is moving forward with killer new content and additions to the game. I was so excited this week to get a chance to play through the Bringing Home the Bacon questline and scout out the open beta of the HTML5 version. I was initially eager to see just how much better the HTML5 version looked and played, but I didn’t want to dive in until any issues had been worked out. Boy, does it impress. Sure, it might not seem like much to someone who is used to the graphics from games like Guild Wars 2, but this browser game that is over a decade old looks great not only for a browser game but for any type of game. It’s still a bit of an acquired taste, but once you try it, you’ll be smitten. I also had fun playing through the bacon-flavored quest line that is featured this month. I’ll tell you about both… how’s that? First, the HTML5 stuff. 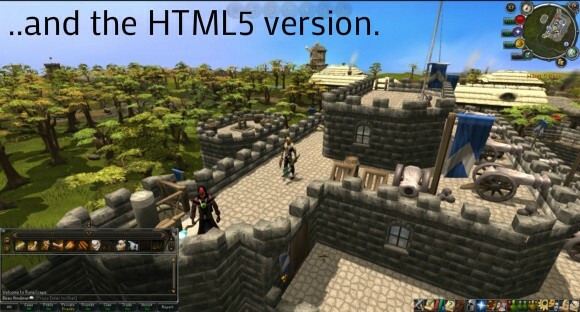 For those who are not familiar with the differences between the Java and HTML5 version of RuneScape, let’s just skip most of the technical mumbo-jumbo. Basically, Java requires a special download and plug-in and has been plagued with performance and security issues for some time. HTML5 allows more flexibility and better performance (sometimes) and even opens up the possibility of a tablet version of RuneScape! I’m sure some of my brilliant techie readers (and I mean that, by the way!) can do a better job of explaining the differences in the comments section. If you enjoyed RuneScape before and have a pretty decent gaming machine, you’ll notice almost no difference in performance between the two clients. The HTML5 version will run about the same, but what you get out of it is much more realistic lighting effects and much, much greater viewing distances. I have embedded some screenshots and even a livestream in this article for comparison. For the record, my gaming machine is nothing amazing. It’s a Core i7 3770 at 3.40GHZ, 12 gigs of RAM, and an AMD Radeon HD 7700. But I do have stellar internet speeds at 150/65 mbps. I can get those consistently and even go over sometimes. Having said that, I do think the HTML5 experience is a bit… jarring. Not only does it seem as if the default zoom level is a bit further out than I am used to, but the sharp details and massive view distance destroy the RuneScape I was used to. I am aware that new graphics take time to get used to, especially when they come along in a beloved title, and the world of RuneScape is quite large, but that’s only because it involves a lot of underground areas and areas that can be reached only through teleportation. With the view distance pushed out, the world definitely feels smaller. 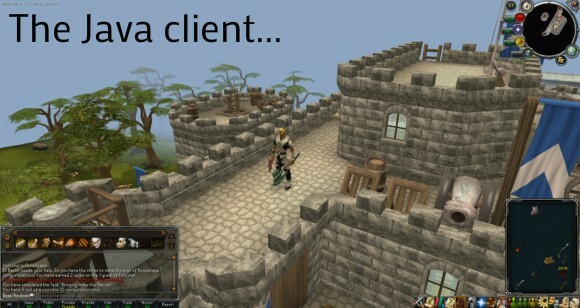 I mean, I can see the swamps from Lumbridge castle! So proceed with caution if you choose to run with the HTML5 version. Those brilliant wackos over at Jagex will continue to tweak and improve the experience, I am sure, but feel free to adjust the view distance if it bothers you. I’m definitely going to be playing with the settings this week. 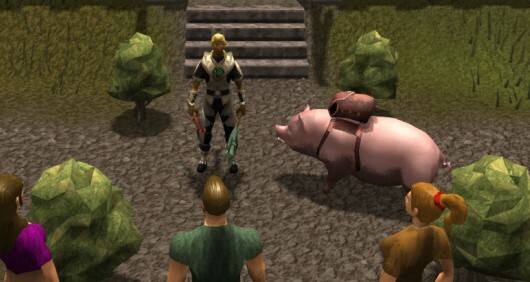 In RuneScape, the citizens think pigs are mainly good for pig wrestling, and that’s it. Eli Bacon has discovered how tasty they are, and it’s your job to help him hatch a plan to rule the soon-to-be bacon-addicted denizens of the town. You’ll run some errands, trick what can only be described as “bacon zombies,” help create a machine to train the pigs, and come out on the other side with access to a piggie helper or two. The quest line is classic RuneScape, sprinkled with some dark humor, plenty of lore, and fantastic animations, voice-overs and cutscenes. What Jagex has been doing with questing is not only top-notch but even more amazing when you consider that the whole thing can run inside your browser. The questline also shows how Jagex enjoys presenting its playerbase with quests that are about more than challenging combat or puzzles. The people who are designing the game obviously have a sense of humor but want to create content that allows you to experience the world. It’s content for the sake of playing the game, not just for hitting a new level or finding amazing gear. The Bringing Home the Bacon quest is a perfect example of why I love RuneScape. While I consider it one of my main MMOs, the truth is that I share my time with it with plenty of other titles. Fortunately for me, the world is filled with fun and immersive quests like this one that can be enjoyed in one sitting. I wish more MMO designers would create gameplay that is just plain fun, funny, inviting, or interesting. I never feel as if I am grinding in RuneScape because there is so much to do besides grind. Check out the new HTML5 client, but compare it to the standard version. You might be surprised how you feel about it. Be aware that Jagex has indicated that unless you are on a gaming rig or more powerful laptop, the Java client might still be the best choice for you. And yes, I checked to see if the HTML5 client worked on my Chromebook. The result? Nope, not really. It still requires something more powerful than what is essentially a tablet processor to run smoothly. I couldn’t even get the world to load, and I had it on low settings. Jump in, check out the new version. and go get some bacon! Don’t worry — it’s not bad for you… it’s digital!